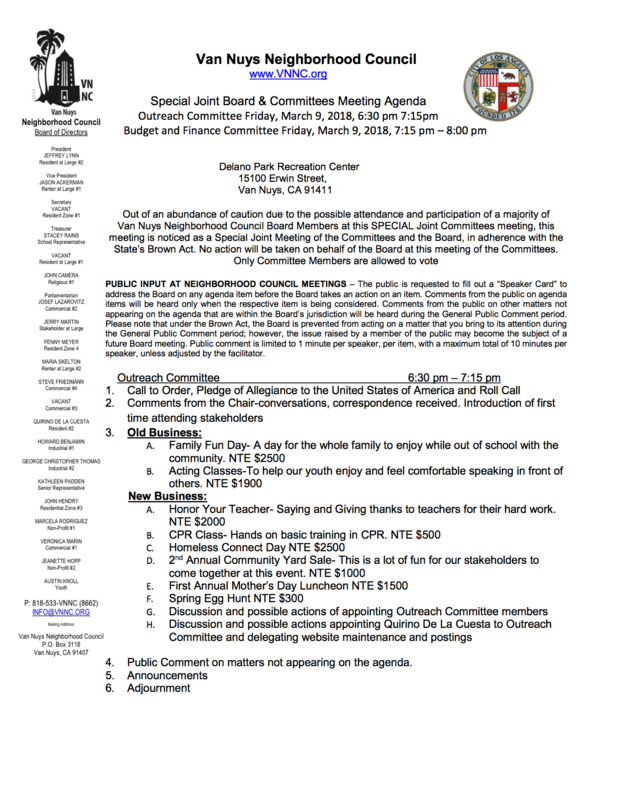 The Van Nuys Neighborhood Council meets on the second Wednesday of the month at 7pm. The General Meeting is held at 6262 Van Nuys Blvd. 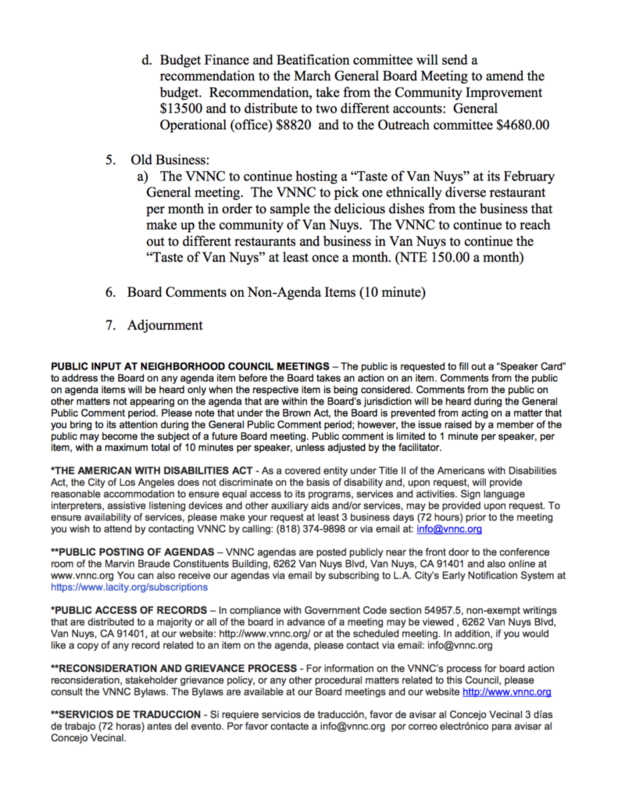 This entry was posted in Van Nuys Neighborhood Council (VNNC), VNNC Budget and Finance Meeting Agenda, VNNC Outreach Committee on March 8, 2018 by vnncadmin. This entry was posted in Van Nuys Neighborhood Council (VNNC), VNNC Budget and Finance Meeting Agenda on February 10, 2018 by vnncadmin. a) The VNNC to look into hiring Wendy Moore of Moore Business Results. The VNNC to continue to discuss possible work assignments for Ms. Wendy Moore, including marketing and email address capturing, web administrator duties, and press release distribution. The VNNC to vote on the expenditure of $350 a month. 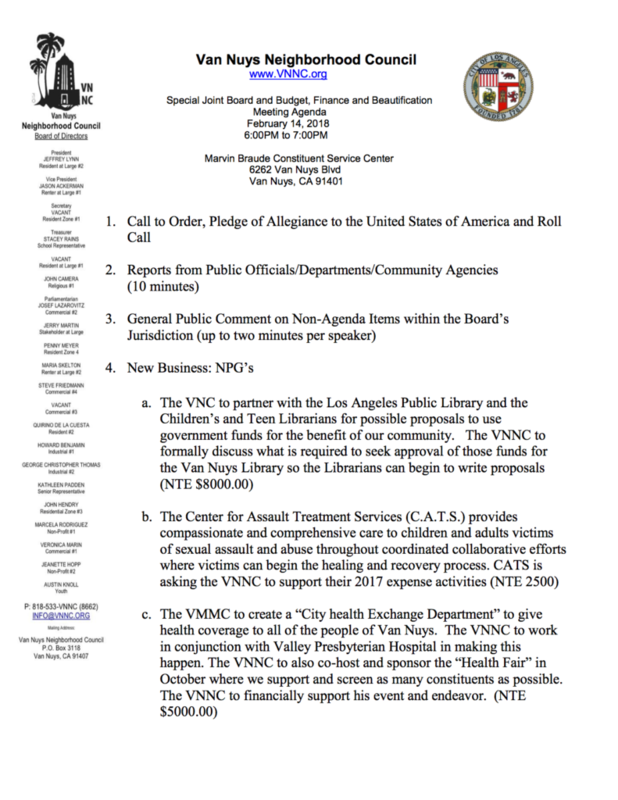 b) Discussion and possible action for the VNNC to hire a certified court reporter to transcribe an interview of the VNNC Board member in regards to a possible litigation mater NTE $750.00. This entry was posted in VNNC Budget and Finance Meeting Agenda on January 7, 2018 by vnncadmin. This entry was posted in VNNC Budget and Finance Meeting Agenda on August 6, 2017 by vnncadmin. Discussion and possible action to approve the purchase of our VNNC storage unit for six months in advance. Our VNNC Store bin bill is due at the end of July 31st. If not paid by that time, our unit contents will be sold at auction. To review, analyze and reinstate Howard Benjamin as our Credit Card Holder for our Budget and Finance Committee 2017-2018 period. As of now, Howard Benjamin has been our credit card holder but was destitute by Ms. Semee Park. We, as Budget and Finance Committee were not aware of this destitution and would are asking Ms. Semee Park for any documentation of any wrong doing from Howard Benjamin that give grounds to his dismissal. To evaluate, support and recommend an outreach campaign by our VNNC for the 311LA app for the benefit of our Van Nuys Community to ease the increase of illegal dumping in our Van Nuys Streets. If approved the recommendation will be sent to our outreach committee for further evaluation. This entry was posted in VNNC Budget and Finance Meeting Agenda on June 24, 2017 by vnncadmin. Van Nuys California from Bob Franco on Vimeo. Subscribe to our agendas on city notification system.